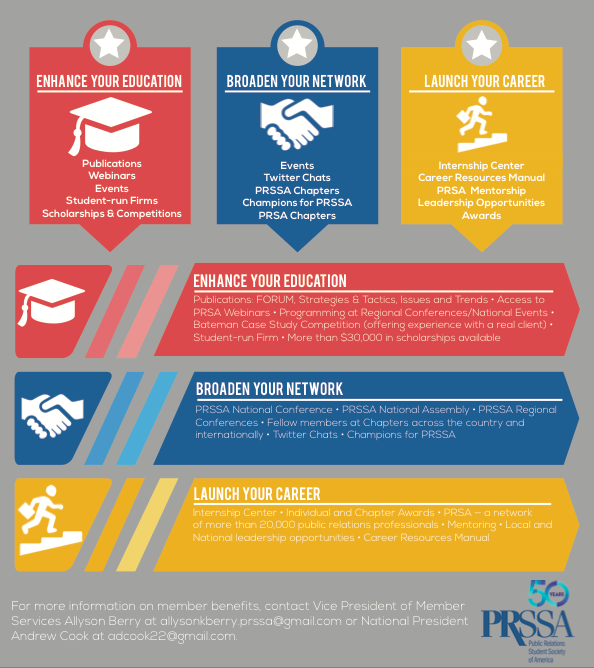 It seems like just yesterday that every PRSSA Chapter was pulling out all the stops to recruit new members. Well, it’s been six months and therefore it’s time to start that process all over again. But this time, there’s something else at stake — retaining the members you already have. Students are able to join PRSSA twice a year, in the fall and spring. Their membership lasts one year. Therefore, the students who joined last January must pay dues once again to be a part of their Chapter and PRSSA National. From my experience, one year can make a big difference in a student’s life. They may have gotten a job, an internship or joined another organization on campus. Regardless, it is important to recognize that just because students joined your Chapter last year, does not mean they will renew their membership. Follow along below to discover ways to make sure you’re not leaving old members behind but rather pulling them along for another fun PRSSA ride. One of the key ways to make sure your members stay engaged throughout their membership is by setting up regular check-ins. My Chapter did this through our mentorship program. At the beginning of each semester, new members had the opportunity to be paired with a veteran member. The role of the veteran was to get to know the new member on a personal and professional level, as well as reminding them of upcoming Chapter meetings and events. This way new members had an immediate contact in the Chapter and knew who to reach out to with questions or concerns. Recruitment season is hectic. As soon as your Chapter has welcomed its new members, there may be a part of you or the Chapter that just wants to sit back and relax. Whatever you do, don’t do that. Instead, reminisce about your experience as a new member. Didn’t you have questions or concerns within the first couple of days if not weeks? Consider sending around a monthly survey to new members, asking them a multitude of items including how they’d rate their membership experience so far as well as where they see room for improvement. This was something my Chapter did on a consistent basis and as a result, we were able to receive a lot of helpful information and ideas that we’ve since incorporated into our recruitment and retention strategy. Arrange gatherings for new members. When students join PRSSA, it’s important to make sure they are aware of the benefits and opportunities now available to them. Through our member surveys, we found that this was one of the reasons some students decided not to renew their membership. Therefore, last semester my Chapter decided to host a meeting specifically aimed at new members. This meeting outlined what it means to be a PRSSA member and provided them with a presentation of all the national and local resources now available to them. We found that throughout the semester, more members were taking advantage of those benefits and truly getting the most out of their membership. How does your Chapter recruit and retain members? Leave your stories down below! Emma Ingram is a junior studying public relations and strategic communication at American University in Washington, D.C. This year she is serving as the president of her school’s PRSSA Chapter. She was previously the Chapter’s vice president. She also serves on the 2017–2018 Industry News and Current Events Subcommittee for PRSSA National. Follow her on Twitter @emmaaingramm or connect with her on Linkedin.